Crew members from Coast Guard Station New London rescued two people after they abandoned their sinking fishing vessel near Fishers Island, New York, Sunday morning. At approximately 7:30 a.m., watch standers at Sector Long Island Sound received a radio call from the crew of a 55-foot commercial fishing vessel stating their boat was taking on water in one of their fish holds. The command center issued an urgent marine information broadcast and launched a Coast Guard Station Montauk and Station New London rescue boat crew. 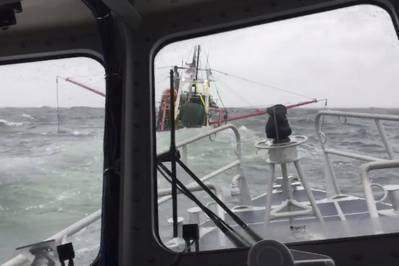 The two people donned survival suits and the fishing vessel maintained a northwesterly course towards the Fishers Island area due to the 8 to 10-foot seas. At approximately 8:20 a.m., the rescue crew from Montauk arrived on scene. They escorted the vessel and at 9:15 a.m., the Station New London crew aboard a 45-foot Response Boat-Medium rendezvoused with the fishing vessel. The Montauk crew returned to base. The New London crew passed over a dewatering pump to the crew members aboard the distressed vessel. The pump was unable to keep up with the rate of flooding and at 9:30 a.m., the two crew members abandoned ship and were quickly picked up by the rescue crew. The boat capsized within one minute of the crew evacuating the vessel.